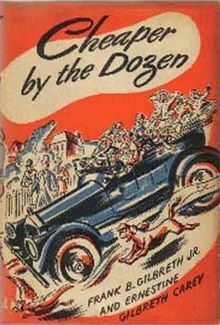 I’ve written about this before, about how preoccupied I am with efficiency; about how growing up one of my very favorite books was Cheaper By the Dozen, written by a guy with twelve children who, fortunately, was an efficiency engineer. So was his wife, I just learned – they were both early advocates of scientific business management. I used to wish I was one of those children, but now I’m thinking it could have been kind of a nightmare, being scientifically managed all the time. But anyway, I have some of this efficiency mania in me; and so, when I have a bunch of unpleasant errands to do like getting blood drawn for a TB test (required yearly for hospice volunteers, and it’s no longer that easy little skin prick) or UPSing a package or, worse, shopping for underwear, if I organize all these things in the most efficient way I can overcome the tedium by feeling inordinately pleased with myself. This entry was posted in Books, My so-called-life and tagged Cheaper by the Dozen, efficiency experts. Bookmark the permalink.